To Fund Research Targeting Heart Disease, the #1 Killer of Women! An Affair of the Heart Luncheon and Fashion Show is a highly anticipated Washington event, spanning over six decades. In fact, this event is one of the oldest annual fund-raising events of any nationally recognized non-profit group. 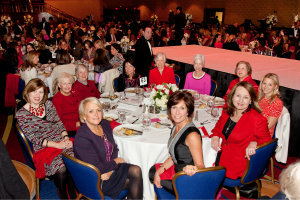 The Women’s Board, comprised of over ninety volunteer members, sponsors the An Affair of the Heart Luncheon and Fashion Show to raise funds aimed at reducing death and disability from heart disease and stroke. Thanks to the 1,000+ guests, and the generous support of corporations and foundations, the Women’s Board has raised $6.3 million over the past thirteen years to fund substantial AHA research grants from esteemed institutions in the region. The Women’s Board joins the AHA’s Go Red for Women campaign in bringing a voice to the silent killer of heart disease to help save lives. Go Red for Women needs you to shatter the silence by choosing to speak up about heart disease. Be part of this joint movement, make healthy choices, speak up and spread the word. The Affair of the Heart Luncheon Co-Chairs continue to focus on women's warning signs for heart attacks and stroke, the number one killer of women. The following pages have important and practical life-saving information that can be shared with loved ones/kept for future home reference: Signs of Heart Attack and Stroke and Heart Health Tools. By sharing in the mission of the Women’s Board and the Go Red for Women campaign, together we can help save lives. Be part of this extraordinary day, where fashion meets philanthropy!